During one recent engagement, I was helping my customer align ETL activities that were originally developed using SQL Server and T-SQL with the capabilities that were available using Hadoop and Hive. Most of the translations where straight-forward but when asked about geospatial support in Hive I was admittedly stumped. After full disclosure to the customer that I am not a geospatial expert I began digging for an answer. Knowing that most if not all of the query functionality available in Hive happens through the use of user-define functions (UDFs), I began my research by looking to see if someone else had already skinned the proverbial cat and I found a gold-mine. ESRI, a provider of GIS software, has not only already solved the problem, but has provided their toolkit of Hive functions to the open-source community via GitHub (get it HERE). For the remainder of this post, I will review the steps necessary to set-up and use this toolkit but also walk through a real-world demo. Since you can download these jar files already compiled from the ESRI GitHub site, I’ll forgo the particulars on building each from its source and get right into the steps required to run these on a HDInsight cluster. Upload both jar files to a container in your blob storage account. Make note of whatever folder/directory structure you use. Using the Hive CLI or the HDInsight Query Console, declare both jar files or alternatively this can be done at the time of you spin up your cluster. For each function that you intend to use, you declare a temporary function as seen in the example. Note that Hive v0.13 supports permanent functions if you will be making wide spread use of these functions. Once the tables are in place, verify by issuing a few select statements using the LIMIT clause to verify that everything is primed and ready to go. With the set-up out of the way let’s turn our attention to a use-case. The narrative for this demo is straight-forward: The Contoso Taxi company is exploring new business opportunities and would like to analyze trips that either originated or terminated at La Guardia International Airport during the last year.The primarily challenge as far as this post is concerned is indentifying which trips are in scope for the purpose of analysis. To start, the data for this time period is moderately substantial with about 2gb of data generated each month which makes using Hive beneficial since we can leverage it distributed nature for the purpose of processing. Complicating matters however it the trip data that only contains a latitude/longitude for both pickup and drop-off locations. So how can we go about solving this problem in Hive using the ESRI Geospatial UDFs? First, I used one of the many free mapping tools found on the interwebs to define a polygon that encapsulates La Guardia. This polygon is defined by a series of lat/long points and is represented in well-known text (WKT) format as seen below. Since we are interested in doing an analysis only on the trips identified, we would most like load these into a new table making whatever data transformations are needed in the process. The resulting full example including a new partitioned internal table and declarations is provided below. Running the above script on a 16-node cluster and it completed in 638 seconds (your results may vary). Query the results to sample/review and ensure everything is in order. 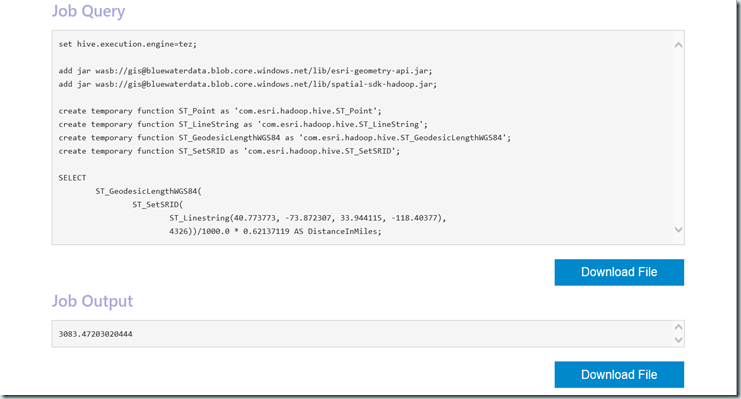 In this post I introduced the ESRI Geospatial UDF library and the steps needed to run in on a HDInsight cluster. I discussed building a demo on real-world data to highlight a portion of the capabilities these functions provide. I hope you were able to take away at least a high level overview of the geospatial capabilities available within Hive and that should the need arise in a future project you can leverage these capabilities as appropriate. Till next time!